A Philadelphia high school with a focus on agricultural sciences has just been recognized alongside two benefactors for undertaking an innovative approach to STEM. The W.B. 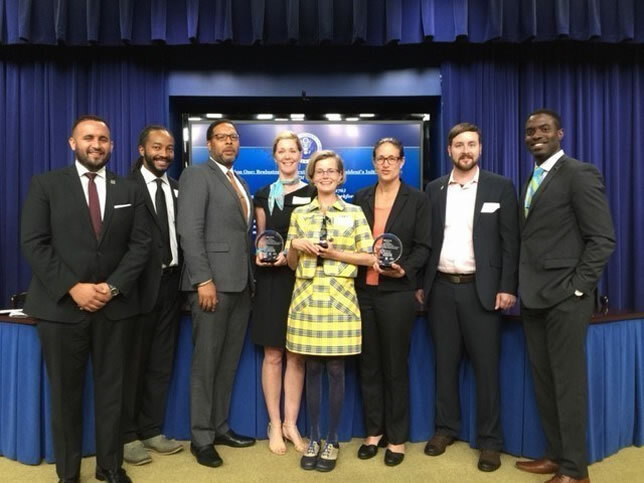 Saul High School recently accepted the US2020 STEM Mentoring Award in the category of "excellence in public-private partnerships," during a STEM Mentoring Symposium at the White House. The high school won along with its collaborators, The Nature Conservancy and the CH2M Foundation. Recipients from W.B. Saul High School in Philadelphia, the CH2M Foundation and The Nature Conservancy show their award for a public-private partnership to teach STEM to high schoolers. Source: CH2M. At the end of last year the foundation had awarded a $200,000 grant to the Conservancy to develop a green infrastructure and a STEM education pilot project. Over the next two years engineers and scientists from both of those organizations will work with students and teachers at the high school to design and build a green infrastructure project on the school campus involving water management work to address storm water quantity and quality concerns. The 130-acre campus is a unique one. The site borders the sizable Fairmount Park and contains greenhouses, a working farm for a meat science program, a golf course, field crops and a pasture area for livestock. The latest project has two goals: to bump up interest in green careers that involve science, technology, engineering and math by putting students in touch with mentors and immersing them in project-based learning; and to engage the broader school community in the value of green infrastructure for urban settings, which could include bioswales, small wetlands, green roofs and rain gardens. "With this grant, teachers will be able to provide a true hands-on application of the agricultural curriculum that is currently being taught," noted agricultural dean, Jessica McAtamney, in a prepared statement. "The grant will enable Saul's teachers' to be at the forefront of teaching environmental technology." "Studies show that informal science learning outside the classroom plays a crucial role in sustaining long-term understanding and interest in STEM fields," added Brigitte Griswold, director of youth engagement programs for the Conservancy. "The students who attend W.B. Saul High School will be leading the development of this green engineering solution right on their campus. This partnership will help further students' understanding, interest and engagement in STEM principles, as well as model career paths that will help develop the next generation of STEM leaders in our country." US2020 was founded by Chevron and Tata Consultancy Services to celebrate organizations taking on STEM mentoring. This was the first year that the program recognized public-private partnerships. Another recipient of the same award was biotech company Genentech, which has committed to making science accessible for students within the South San Francisco Unified School District and which mobilizes Genentech employees to introduce young people to biotech. Yahoo and Covestro, high-tech polymer supplier, were also recognized for excellence in corporate culture for promoting STEM "volunteerism" among their worldwide staffs. EnCorps STEM Teachers Program received an excellence in volunteer experience award for helping recruit, train, and support STEM professionals to teach and tutor California's most needy students in math and science. The same award also went to FIRST North Carolina, which uses robotics to inspire youth to pursue careers in science and technology and where STEM professionals tend to volunteer on average 200 hours per year.